Each evening, more than seven million listeners tune in to Delilah. Her unique blend of love songs, compassionate advice, and tell-it-like-it-is honesty makes people feel as if they've just discovered the best friend they never knew they had. Thousands of these fans dial Delilah's phone lines every night, prepared to share their crises and most private fears, their precious moments and special celebrations. 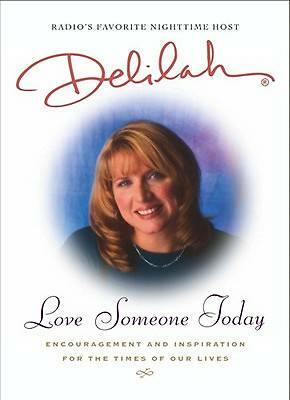 Delilah responds with encouragement and love, leaving each caller with a song selected just for them. "People open their hearts to Delilah nightly, but they've never fully known the woman behind the voice. Until now." In this remarkable book, Delilah vividly shares her personal strength and faith. She takes us inside her life, illuminating along the way her message that life's first priority is love. Whether telling of a mother's joy or of a stranger's kindness, Delilah inspires us to see that we all have the power to bring love and light into our lives and the lives of those around us. Delilah's listeners are given a voice, too, and their stories weave in and out of Delilah's narrative, echoing her sentiments. "Love Someone Today" is a book for all of us, transcending race, age, gender, and geography, and proving that love is universal.